Bosco Legal Services, Inc. employs social media investigation experts that work with law firms and insurance companies that can benefit from the evidence gathered from these investigations, but may not have the time, resources or expertise for social media discovery. Bosco Legal Services, Inc. is a family-owned litigation support firm providing a full range of legal services throughout California. We pride ourselves on the quality of service that we provide for process service, investigations, skip tracing and other services throughout the state. At Bosco Legal Services, Inc., our investigators provide comprehensive private investigations for law firms and insurance companies. We have the resources and experience to gather important data for our clients through a variety of means including online investigations and surveillance. With our branch offices and our network of trusted affiliates, Bosco Legal Services handles assignments both statewide and nationwide. By focusing on each client's unique needs and requirements, we make every effort to provide quality customer service to all of our clients. Established in 1988, our California firm has 30 years of experience providing legal support to law firms and insurance companies not only in Riverside, but across the country. We offer a unique perspective built on a holistic understanding of the litigation process and a desire to be problem solvers. Do You Need California Legal Support? Our staff provides support to lawyers, insurance adjusters or other professionals who may not have the time, resources or experience to perform various tasks on their cases. We offer a full range of legal services and support, with a specific focus on private and social media investigations, service of process, records retrieval and court filings. Whether you need assistance with a personal injury, employment, worker’s compensation or any other type of case, we provide our clients with comprehensive investigations, including social media, surveillance, background checks and locating people and assets. We are a family-owned, legal service provider based in Riverside, California with extensive experience handling cases nationwide. Call our Riverside office at (951) 289-5761 or contact us online today to learn how our team can assist you. Bosco Legal Services, Inc. started in the kitchen of a small Inland Empire home in 1988. Long before automation and current technological advancements, we were perfecting the basics in service of process and private investigations. 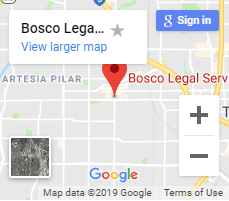 Today, Bosco Legal Services has grown to be a top legal service provider with multiple offices throughout Southern California. We are still family owned and operated and we haven’t lost sight of what has brought our success: Our clients.